Glaston Compressor Services stock a wide range of air compressor accessories, including compressed air filters that will ensure consistent performance of your compressed air systems. Compressed air filters are a vital piece of equipment that ensure the air produced through your compressor system is clean. At Glaston, our compressor air filtration systems can remove particulate down to 0.01 micron and oil down to 0.01 parts per million. All of our compressed air filtration systems and elements are compliant with ISO8573 – the compressed air purity standards. We can also supply complete breathing air purification systems, as well as the associated elements. Compressed air filtration systems offer vital protection for your air compressor by removing any particulate and oils in the air. At Glaston, our ranges of compressed air filters are all specially designed to meet the needs of a wide range of industries. 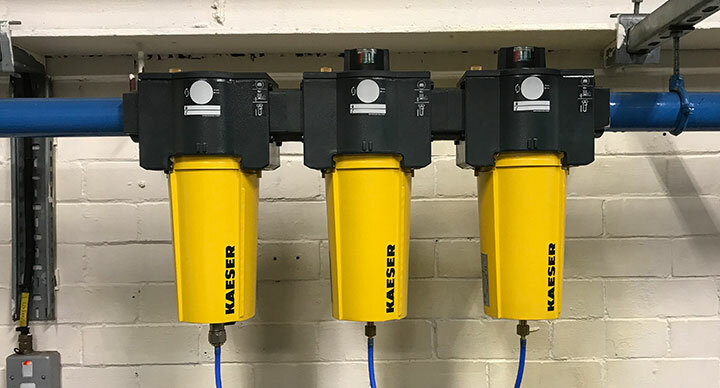 Our compressed air filtration systems also allow us to address the issues of compressed air purity requirements and standards for a range of applications. Failure to filter compressed air can have a significant impact on your system and will result in a number of control issues. These can include contamination within the compressed air system and quality issues. Glaston stocks an extensive range of elements and compressed air filters for the following compressed air systems. Our team of engineers offer expert advice on compressed air treatment and compressed air filtration. We recognise that each client has specific requirements and design bespoke compressed air solutions to suit you. If you have any questions or for more information about our compressed air filters, or any other services, such as nitrogen generators and vacuum pumps, please contact us today. At Glaston we can help source, supply, install and maintain compressed air systems to meet your individual specifications.